Background Hepatocyte-specific NEMO/NF-κB deleted mice (NEMOΔhepa) develop spontaneous non-alcoholic steatohepatitis (NASH). Free fatty acids and bile acids promote DR5 expression. TRAIL/NK cell-mediated activation of TRAIL-R2/DR5 plays an important role during acute injury in NEMOΔhepa mice. Aim To inhibit the progression of NASH in the absence of hepatocyte-NEMO/NF-kB signaling. Methods NEMOf/f and NEMOΔhepa mice were fed with a low-fat diet, and with two anticholestatic diets; UDCA and NorUDCA. The impact of these treatments on the progression of NASH was evaluated. Results We show that high expression of DR5 in livers from NEMOΔhepa mice is accompanied by an abundant presence of bile acids (BAs), misregulation of BA transporters and significant alteration of lipid metabolism-related genes. Additionally, mice lacking NEMO in hepatocytes spontaneously showed ductular response at young age. Unexpectedly, feeding of NEMOΔhepa mice with low-fat diet failed to improve chronic liver injury. Conversely, anti-cholestatic treatment with nor-ursodeoxycholic acid (NorUDCA), but not with ursodeoxycholic acid (UDCA), led to a significant attenuation of liver damage in NEMOΔhepa mice. The strong therapeutic effect of NorUDCA relied on a significant downregulation of LXR-dependent lipogenesis and the normalisation of BA metabolism through mechanisms involving cross-talk between Cyp7a1 and SHP. This was associated with the significant improvement of liver histology, NEMOΔhepa/NorUDCA-treated mice showed lower apoptosis and reduced CyclinD1 expression, indicating attenuation of the compensatory proliferative response to hepatocellular damage. Finally, fibrosis and ductular reaction markers were significantly reduced in NorUDCA-treated NEMOΔhepa mice. Conclusions Overall, our work demonstrates the contribution of bile acids metabolism to the progression of NASH in the absence of hepatocyte-NF-kB through mechanisms involving DR5-apoptosis, inflammation and fibrosis. Our work suggests a potential therapeutic effect of NorUDCA in attenuating the progression of NASH. Hepatocyte-specific deletion of NEMO promotes non-alcoholic steatohepatitis. The TRAIL/NK cell axis plays a key role in the development of NASH in the absence of hepatocyte NEMO. Free fatty acids and bile acids promote TRAIL-R2 DR5 expression. High expression of DR5 in NEMO-deficient mice correlates with high presence of bile acids. A low-fat diet failed to attenuate liver steatosis and the spontaneous damaging phenotype of livers from hepatocyte-NEMO deficient mice. An anticholestatic diet containing nor-ursodeoxycholic acid (NorUDCA) significantly ameliorated liver damage in hepatocyte-NEMO deficient mice. The therapeutic effects of NorUDCA relied on the down-regulation of LXR-dependent lipogenesis and the normalisation of bile acids related metabolism. Finally, NorUDCA treatment resulted in lower apoptosis, ductular response and fibrosis in hepatocyte-NEMO deficient mice compared to untreated KO animals. Our data point out the potent therapeutic effects of NorUDCA treatment to counteract the development of NASH. In our present work, we show that NEMOΔhepa mice exhibit significantly higher BA levels than WT littermates, which is accompanied by strong fat accumulation in the liver. This led us to hypothesise that accumulation of toxic BAs and/or FFAs may induce upregulation of DR5 expression in NEMOΔhepa mice promoting hepatocyte apoptosis and contributing to NASH progression. Here we investigated whether dietary intervention using low-fat (LFD) or anti-cholestatic diets such as ursodeoxycholic (UDCA) and 24-nor-ursodeoxycholic acid (NorUDCA) are able to inhibit liver disease progression in NEMOΔhepa mice. Four-week-old NEMOΔhepa and NEMOf/f mice were fed with low-fat (providing 10% energy per cent in the form of lard fat (D12450B; Research Diets, New Brunswick, New Jersey, USA), UDCA or NorUDCA-enriched (0.5% w/w) diets as described previously.14 15 Control animals were fed with a standard chow diet (Sniff, Soest, Germany). Serum samples were frozen at −80°C upon extraction and were analysed for alanine aminotransferase (ALT), aspartate transaminase (AST), BAs and alkaline phosphatase (AP) on a Hitachi 717 analyser (Boehringer Mannheim, Germany). Individual RNA samples from untreated NEMOf/f, NEMOΔhepa and NorUDCA-treated NEMOΔhepa mice were used for microarray analysis. Samples were hybridised on Affymetrix Gene Chip Mouse Genome 430 2.0 arrays (Affymetrix, Santa Clara, California, USA) according to manufacturer's instructions. Expression levels were calculated applying the GC-robust multi-array (GCRMA) analysis, employing the empirical Bayes' approach for background adjustment, followed by quantile normalisation and summarisation Aremapped Gene Chip Description (CDF) File16 was used to define probe sets based on Entrez IDs. In this way 16 331 unique genes (Entrez) are targeted by the arrays. Heat maps were generated and cluster analysis (k-means) was performed using the multiple experiment viewer (PMID: 16 939 790, PMID: 12 613 259). Differentially regulated genes were identified by intensity-based moderated t-statistics (PMID: 17 177 995). The p-values obtained were corrected for multiple testing using a false discovery rate method (PMID: 12 883 005). A false discovery rate of 5% (q<0.05) was considered significant. Data were further analysed through the use of Ingenuity Pathways Analysis (Ingenuity® Systems, http://www.ingenuity.com). Canonical pathways analysis identified the most significantly regulated pathways. Genes were considered for the analysis that met the q-value cut-off <0.05 and fold change >1.5. Fisher's exact test was used to identify significantly regulated pathways. Detailed descriptions of the methods applied are available on request. Total RNA from snap-frozen mouse livers was isolated with PeqGOLD-RNAPure kit (Peqlab). First-strand synthesis was performed with Oligo dT primers and reverse transcription with M-MLV Reverse Transcriptase (Invitrogen, Carlsbad, CA, USA). Quantitative Real Time PCR was performed using SYBR Green Reagent (Invitrogen) in 7300 Real Time PCR system (Applied Biosystems, Foster City, CA, USA). GAPDH expression was used to normalise gene expression. Livers from mice were harvested and after fixation with 4% paraformaldehyde were embedded in paraffin for further histological evaluation by haematoxylin & eosin staining. Adipophilin staining on paraffin liver sections was performed to assess steatosis using an anti-adipophilin antibody (Vector Laboratories, Burhingame, CA, USA). After developing with ABC solution (Dako, Glostrup, Denmark) and DAB (Sigma, St Louis, MO, USA), slides were counterstained with haematoxylin. This system was also used to detect CK19 (Troma III; Developmental Studies Hybridoma Bank, Iowa City, Iowa, USA) on liver sections. Immunohistochemistry (IHC) and immunofluorescence were performed on cryosections for collagen I antibody (Biotrend, Cologne, Germany) following Cy-3 labelled secondary antibody (Jackson Research, Suffolk, UK). For the determination of apoptosis, we performed IHC with active caspase-3 rabbit polyclonal antibody (R&D Systems, Abingdon, UK) and CK18 that were used following Cy3 and fluorescein isothiocyanate (FITC)-labelled secondary antibody. Also, apoptosis was evaluated by counting apoptotic bodies on H&E stained liver sections. For negative controls the primary antibody was omitted. Whole protein extracts were subjected to SDS–polyacrylamide gel electrophoresis and blotted. Membranes were probed with the Cyclin D1 (Santa Cruz Biotechnology, Santa Cruz, California, USA) and CK19 (Troma III). GAPDH from Biogenesis (Bournemouth, UK) was used as loading control. As secondary antibodies we used anti-rabbit IgG HRP-linked from Cell Signalling Technology (Beverly, Massachusetts, USA) and anti-mouse IgG HRP-linked (Santa Cruz Biotechnology). Data are expressed as mean±SD of the mean (SDM). Statistical significance was determined by two-way analysis of variance followed by the Student t test. NEMO-dependent NF-κB activation is essential to preserve liver homeostasis.1 2 5 NEMOΔhepa mice show severe liver damage reflected by high transaminases, which is associated with significantly increased bile acid (BA) and alkaline phosphatase serum levels compared to WT littermates (figure 1A). Transcriptional analysis of liver tissues by gene-microarray analysis revealed a total of 2007 genes that were differentially regulated (q<0.05) in 8-week-old untreated NEMOΔhepa mice compared to NEMOf/f littermates (figure 1B). Analysis of the microarray data by ingenuity revealed that genes related to liver fibrosis pathways scored highest on the ingenuity ranking (supplementary figure 1). Interestingly, disturbed BA homeostasis and cholestasis was the fourth highest scoring pathway in NEMOΔhepa compared to NEMOf/f livers. Accordingly, LXR/RXR and FXR/RXR (key regulatory nuclear receptor) pathways scored within the 20 top pathways in this analysis (figure 1B). Hepatocyte-specific NEMO deletion promotes misregulation of bile acid (BA) and lipid metabolism, inflammation and fibrosis. (A) Serum analysis showed spontaneously increased alanine aminotransferase (ALT), bile acids (BAs) and alkaline phosphatase (AP) levels in NEMOΔhepa mice. (B) Differential gene expression between NEMOΔhepa and NEMOf/f littermates. The left side shows the gene expression pattern in the livers of three NEMOf/f mice (WT 1, WT 2, WT 3). The right side shows the expression pattern in two NEMOΔhepa mice (KO1, KO2). The lines represent 2007 genes that were differentially expressed (q<0.05). The data are presented as signal log ratios between individual samples and the mean of the expression values in NEMOf/f mice. Red indicates that gene expression is higher in NEMOΔhepa compared to NEMOf/f; blue indicates lower expression. (C) Quantitative RT-PCR analysis of liver RNA of untreated WT and NEMOΔhepa animals. Values are normalised with GAPDH levels and expressed in times versus expression in WT animals. (D) Histological analysis by H&E and immunohistochemistry using an adipophilin antibody on paraffin liver sections. Immunofluorescent staining of frozen liver sections for collagen 1A1 (red, collagen positive cells; blue, DAPI stained nuclei). Original magnification, ×20. n=4 animals/time point, (***p<0.001; **p<0.01; *p<0.05 NEMOf/f vs NEMOΔhepa). DAPI, 4′-diamidine-2′-phenylindol dihydrochloride. Quantitative RT-PCR confirmed the differential regulation of LXR/RXR- and FXR/RXR-related genes between the two genotypes. FasN was upregulated in NEMOΔhepa mice while BA transporters Abcg5 and Abcg8 were significantly downregulated in the liver of these mice (figure 1C). Additionally, transcription factor FOXo1, involved in glucose metabolism and adiponectin transcription17 18 was significantly downregulated in NEMOΔhepa livers compared to WT littermates (figure 1C). PPARα expression was strongly reduced accompanied by an upregulation of PPARγ and LPL in NEMOΔhepa animals suggesting an impaired lipid metabolism in NEMOΔhepa mice (figure 1C). BAs and FFAs promote DR5 mRNA expression independently of NF-κB activation.10 Accordingly, NEMOΔhepa mice showed significantly higher DR5 mRNA levels and higher expression of pro-inflammatory and chemoattractant cytokines like tumour necrosis factor (TNF), interleukin-12 (IL-12), interferon-γ (IFNγ) and CCL5 compared to WT littermates (figure 1C). Microarray and RT-PCR analysis also highlighted the upregulation of pro-fibrogenic genes like collagen 1A1 and αSMA in NEMOΔhepa livers. Finally, the classical marker for stem cells and reactive bile ducts, CK19, was highly upregulated in untreated NEMOΔhepa compared to NEMOf/f livers (figure 1C). Histological analysis of liver sections confirmed the spontaneous injury of liver parenchyma, accompanied by strong fat accumulation and early stages of fibrosis in NEMOΔhepa mice (figure 1D). Together these data suggest that hepatocyte-specific NEMO deletion leads to altered lipid metabolism and dysregulated hepatobiliary transport systems. Based on strong liver steatosis accompanied by increased expression of fat metabolism related genes found in NEMOΔhepa mice (figure 1) we sought to test the potential therapeutic effect of a low fat diet (LFD) in NEMOΔhepa mice. No improvement of AST levels was observed in NEMOΔhepa mice fed with a LFD for 4 weeks (figure 2A). Moreover, a significant increase in transaminase levels could be detected after 8 weeks of LFD feeding. The negative effect on liver parenchyma was confirmed by histological analysis showing clear cellular damage and progression of liver steatosis throughout LFD treatment (figure 2B). RT-PCR analysis of fat metabolism related genes confirmed the lack of a beneficial effect of LFD feeding on NEMOΔhepa mice. After 8 weeks of LFD, SREBP and FasN expression was significantly increased and PDK4 and PPARγ levels were not significantly affected (figure 2C). A low-fat diet (LFD) has no beneficial effects on the spontaneous progression of non-alcoholic steatohepatitis (NASH) in NEMOΔhepa mice. (A) Serum analysis showed no significant differences in aspartate transaminase (AST) levels throughout LFD treatment. (B) H&E staining and adipophilin immunohistochemistry on paraffin embedded liver sections (C) Quantitative RT-PCR of liver RNA of LFD-fed NEMOΔhepa mice. Values are normalised with GAPDH levels and expressed in times versus expression in NEMOΔhepa at 0 weeks. (D) Immunofluorescence of cryo-preserved liver sections using an anti-collagen 1A1 antibody (red, collagen positive cells; blue, DAPI stained nuclei). Original magnification, ×20. n=4 animals/time point, (***p<0.001; **p<0.01; *p<0.05 NEMOf/f vs NEMOΔhepa). DAPI, 4′-diamidine-2′-phenylindol dihydrochloride. Marker genes for liver inflammation, for example TNF, CCL5, IL-12 and IFNγ, remained unaltered, while TRAIL, a molecule involved in liver disease progression of NEMOΔhepa mice,2 was significantly elevated after 8 weeks of LFD feeding (figure 2C). Additionally, pro-fibrogenic gene expression was significantly elevated after 8 weeks of LFD treatment in NEMOΔhepa mice (figure 2C). Immunofluorescence of collagen IAI confirmed this result showing a clear progression of fibrosis in NEMOΔhepa mice throughout LFD treatment (figure 2D). Overall, these data demonstrate that feeding a LFD has no beneficial effect on liver disease progression in NEMOΔhepa mice. We observed a strong reduction of AST levels in the serum of both NorUDCA- and UDCA-treated NEMOΔhepa mice (figure 3A). However, decreased ALT levels were only observed in NorUDCA-treated NEMOΔhepa animals. Accordingly, histological analysis revealed a clear improvement in NEMOΔhepa livers only after NorUDCA treatment (figure 3B; low left panel). 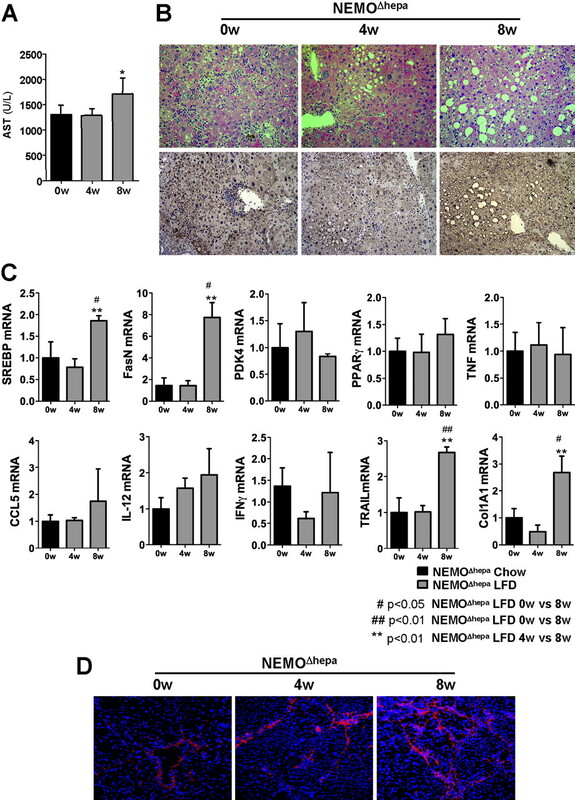 In contrast, feeding of the parent compound, UDCA, had no beneficial impact on livers from NEMOΔhepa animals as apoptotic bodies and inflammatory infiltrated cells could still be observed on liver sections (figure 3B; lower right panel). A nor-urseodeoxycholic acid (NorUDCA) diet significantly improves liver parenchyma status in NEMOΔhepa mice, in contrast to ursodeoxycholic acid (UDCA). (A) A NorUDCA diet significantly reduced serum aspartate transaminase (AST) and alanine aminotransferase (ALT) levels while UDCA had only a lowering effect on AST levels. (B) Histological analysis of liver sections showed strong improvement and restoration of liver parenchyma status in NorUDCA treated NEMOΔhepa mice. UDCA had no obvious impact on liver histology of NEMOΔhepa mice. (C) Microarray analysis of livers from untreated NEMOΔhepa and NorUDCA fed NEMOΔhepa mice for 4 weeks; ‘Normalised’ gene expression by NorUDCA treatment in NEMOΔhepa mice. The gene expression pattern is shown for the liver of NEMOf/f mice, NEMOΔhepa, and NEMOΔhepa treated with NorUDCA. Lines represent 2007 genes that were differentially expressed between NEMOΔhepa and NEMOf/f animals. The data are presented as signal log ratios between individual samples and the mean of the expression values in NEMOf/f mice. Red indicates that gene expression is higher in NEMOΔhepa compared to NEMOf/f, blue indicates lower expression. K-means clustering was used to identify clusters of genes with a similar expression pattern. Two clusters were identified in which the expression pattern in NEMOΔhepa mice treated with NorUDCA resembled the expression in NEMOf/f mice. The black bar indicates these clusters. The expression of these genes was considered ‘normalised’ by NorUDCA treatment. Original magnification, ×20. n=4 animals/time point. (***p<0.001; **p<0.01; *p<0.05 NEMOΔhepa vs NorUDCA-NEMOΔhepa and NEMOΔhepa vs UDCA-NEMOΔhepa). To better define the potential molecular mechanisms underlying the beneficial effect of NorUDCA on disease progression of NEMOΔhepa livers we performed gene array analysis. As shown in figure 3C, heat map analysis revealed that, in part, the gene expression profile of NEMOΔhepa livers after NorUDCA reverted towards WT littermates when compared to control fed KO animals (see also figure 1). Moreover, ingenuity ranking demonstrated that 15 pathways that were differentially expressed between NEMOΔhepa and NEMOf/f littermates were normalised after NorUDCA feeding in NEMOΔhepa mice (supplementary figure 2). Most striking was normalisation of a significant number of genes involved in hepatic fibrosis and hepatic cholestasis. In addition, signalling pathways associated with FXR, RXR and PPAR were affected. Genes in the LXR/RXR pathway were affected by NorUDCA treatment, but the pathway as a whole did not reach statistical significance. In summary, NorUDCA treatment significantly attenuated liver damage and normalised several signalling pathways in NEMOΔhepa mice suggesting its potential beneficial effects in blocking NASH progression in NEMO-deleted hepatocytes. To further dissect the effect of NorUDCA treatment on NEMOΔhepa mice, we analysed its impact on lipid metabolism related gene expression by RT-PCR. Notably NorUDCA promoted downregulation of the orphan receptor small heterodimer partner (SHP) while UDCA had no impact on its expression (figure 4A). BAs promote FXR that activates SHP and consequently downregulates Cyp7A1 expression, an enzyme mainly involved in cholesterol-dependent BA production.6 Associated with SHP downregulation, we observed a significant increase in Cyp7A1 mRNA levels upon NorUDCA treatment in NEMOΔhepa livers (figure 4A). We also observed a restoration on the mRNA levels of two main transporters; Abcg8 and Mrp2, in NEMOΔhepa mice after NorUDCA and UDCA feeding (figure 4A) and a significant increase on cholesterol transporter HMGCR in NorUDCA-fed animals. In line with reduced fat accumulation in NorUDCA-treated NEMOΔhepa livers, we found lower levels of the main regulators of lipid synthesis FasN, SREBP and PPARγ. In contrast, UDCA treatment had no significant effect on the expression of these genes (figure 4A). Interestingly, both NorUDCA and UDCA significantly reduced LPL levels. PPARα and its target genes; CPT-1 and ACOX, which promote lipid degradation through β-oxidation showed decreased expression upon NorUDCA treatment. No significant regulation of PPARα and ACOX-1 expression levels was observed in UDCA-fed NEMOΔhepa mice (figure 4A). 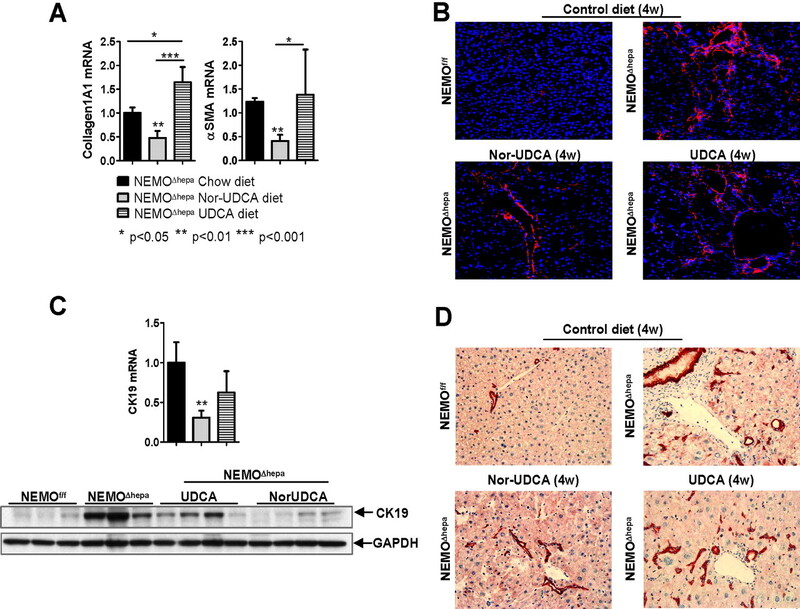 Nor-ursodeoxycholic acid (NorUDCA) but not ursodeoxycholic acid (UDCA) significantly improves lipid- and bile acid (BA)-related gene expression and reduces liver steatosis in NEMOΔhepa mice. (A) Quantitative RT-PCR of liver RNA of chow diet, NorUDCA and UDCA fed NEMOΔhepa mice. Values are normalised with GAPDH levels and expressed in times versus expression in NEMOΔhepa fed with chow diet. (B) Immunohistochemistry using an adipophilin antibody on paraffin liver sections to assess liver steatosis. Original magnification, ×20. n=4 animals/time point. (***p<0.001; **p<0.01; *p<0.05 chow diet–NEMOΔhepa vs NorUDCA–NEMOΔhepa, chow diet–NEMOΔhepa vs UDCA–NEMOΔhepa and NorUDCA–NEMOΔhepa vs UDCA–NEMOΔhepa). To establish the physiological relevance of the differential regulation of lipid synthesis and lipid degradation-related genes by the two compounds, we determined the degree of liver steatosis. We thus performed IHC for adipophilin, which has been described as a marker for lipid storage in different tissues.20 Adipophilin staining of liver sections revealed a significant attenuation of liver steatosis in NorUDCA NEMOΔhepa-treated mice in contrast to UDCA-treated animals, which showed persistent liver fat accumulation (figure 4B). Overall, these data suggest that the beneficial effect of NorUDCA on liver steatosis in NEMOΔhepa mice is dependent on its direct effect on inhibiting lipid synthesis, rather than by promoting lipid degradation. Hepatocyte apoptosis and the consequent inflammatory response represent one of the main contributors of NASH progression.21 NEMOΔhepa mice exhibit increased spontaneous expression of pro-inflammatory cytokines and chemoattractant chemokines like TNF, IFNγ and CCL5 (see figure 1). Next, we investigated if NorUDCA treatment attenuates liver inflammation in NEMOΔhepa mice. NorUDCA treatment significantly downregulated TNF, IL-12, IFNγ and CCL5 expression. In contrast, expression of these cytokines and chemokines remained unchanged upon UDCA treatment, while only IL-12 levels decreased (figure 5A). Additionally, both TRAIL and its receptor DR5, which are involved in liver injury in NEMOΔhepa mice,2 were significantly downregulated (figure 5A). 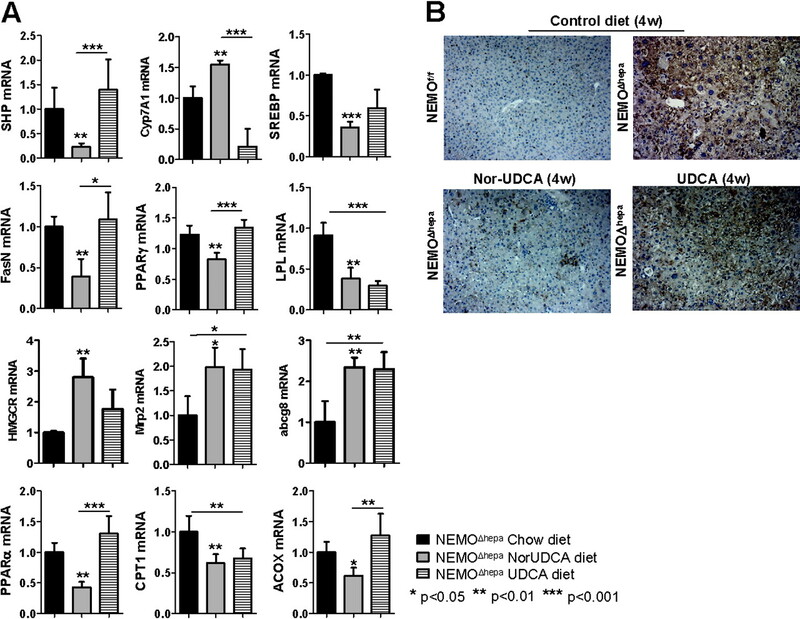 A nor-ursodeoxycholic acid (NorUDCA) diet but not an ursodeoxycholic acid (UDCA) diet significantly attenuates inflammation and apoptosis in NEMOΔhepa mice. (A) Quantitative RT-PCR of liver RNA of chow diet, NorUDCA and UDCA fed NEMOΔhepa mice. Values are normalised with GAPDH levels and expressed in times versus expression in NEMOΔhepa fed with chow diet. (B) Immunofluorescence using an active caspase-3 antibody (red, caspase 3 positive cells; green, CK18 and blue, DAPI stained nuclei). (C) Apoptotic bodies per power field counted on H&E stained liver sections (HPF, ×400). (D) Western blot analysis on whole protein extracts using a cyclin D1 antibody. GAPDH was used as loading control. Original magnification, ×100. n=4 animals/time point (**p<0.01; *p<0.05 chow diet–NEMOΔhepa vs NorUDCA–NEMOΔhepa, chow diet–NEMOΔhepa vs UDCA–NEMOΔhepa and NorUDCA–NEMOΔhepa vs UDCA–NEMOΔhepa). In agreement with these data, immunofluorescence of liver sections revealed a significant reduction of caspase-3-positive cells in NorUDCA-treated NEMOΔhepa livers. In contrast, caspase 3 expression in UDCA-treated NEMOΔhepa livers were unchanged compared to untreated NEMOΔhepa mice (figure 5B). Determination of apoptotic bodies per power field confirmed these results (figure 5C) showing a reduced apoptosis rate in NorUDCA compared to UDCA and untreated NEMOΔhepa mice. In NEMOΔhepa livers apoptosis triggers hepatocyte proliferation;5 we thus determined the impact of anti-cholestatic therapy on cyclin D1 protein expression. NorUDCA treatment strongly reduced cyclin D1 protein expression compared to UDCA-treated and untreated NEMOΔhepa mice (figure 5D). Array analysis revealed that fibrosis related genes are strongly upregulated in NEMOΔhepa livers. We thus investigated if NorUDCA treatment inhibited the liver fibrogenic response in these animals. Both collagen IAI and αSMA mRNA levels were significantly reduced in NorUDCA-treated NEMOΔhepa mice. In contrast, UDCA had an opposing effect on collagen expression showing higher levels compared to control and NorUDCA-treated animals. Differences in αSMA levels were not significantly different between untreated and UDCA-treated NEMOΔhepa mice. Immunostaining using a collagen IAI specific antibody confirmed the anti-fibrogenic effect of NorUDCA on liver disease progression of NEMOΔhepa mice (figure 6B), while no beneficial effect could be detected during UDCA treatment as marked collagen fibre production was found in these livers (figure 6B). Feeding nor-ursodeoxycholic acid (NorUDCA) significantly attenuated liver fibrosis and ductular reaction in NEMOΔhepa mice. (A) Quantitative RT-PCR of chow diet-, NorUDCA- and UDCA-fed NEMOΔhepa mice. Values are normalised with GAPDH levels and expressed in times versus expression in NEMOΔhepa fed with chow diet. (B) Immunofluorescence on cryo-preserved liver sections using an anti-collagen 1A1 antibody (red, collagen positive cells; blue, DAPI stained nuclei). Original magnification, ×20. (C) Analysis of CK19 gene expression by quantitative RT-PCR of chow diet-, NorUDCA- and UDCA- fed NEMOΔhepa mice. Values are normalised with GAPDH levels and expressed in times versus expression in NEMOΔhepa fed with chow diet. (D) Immunohistochemistry using an anti CK19 antibody to stain ductular cells. Original magnification, ×40. (C) Western blot analysis of CK19 protein expression using a CK19 antibody. GAPDH was used to normalise the loading. n=4 animals/time point (***p<0.001; **p<0.01; *p<0.05 chow diet–NEMOΔhepa vs NorUDCA–NEMOΔhepa, chow diet–NEMOΔhepa vs UDCA–NEMOΔhepa and NorUDCA–NEMOΔhepa vs UDCA–NEMOΔhepa). NEMOΔhepa livers exhibited high levels of CK19 expression; the classical marker for both stem cells and biliary ductules. NorUDCA treatment significantly downregulated CK19 mRNA and protein levels as evidenced by RT-PCR and western blot analyses (figure 6C). In contrast, UDCA treatment had only a minor effect on CK19 expression in NEMOΔhepa mice. CK19 immunostaining confirmed the strong positivity of CK19 positive cells in NEMOΔhepa livers, which was significantly attenuated in NorUDCA treated animals (figure 6D). Hepatocyte-specific NEMO-deleted mice show spontaneous NASH progression leading to liver fibrosis and HCC development.1 2 5 Recently, we described the contribution of the TRAIL/DR5 axis to liver injury in NEMOΔhepa mice.2 DR5 is a well-known pro-apoptotic receptor that is directly regulated by bile acids and FFA, which promote its expression independently of NF-κB.12 13 High BA and AP levels are evident at basal conditions in NEMOΔhepa mice and are associated with spontaneous liver damage. NEMOΔhepa mice also accumulate fat in the liver at early stages accompanied by upregulation of lipid metabolism-related and lipogenic genes like PPARγ, LPL and FasN. This phenotype is also characterised by a significant downregulation of PPARα, a classical lipid peroxidation mediator. Unexpectedly, in our present study a low fat containing diet did not improve liver injury of NEMOΔhepa mice and was accompanied with progression of steatosis, inflammation and fibrosis. This observation supports the main relevance of apoptosis and inflammation during the progression of NASH and may indicate that lipid accumulation in the liver is not the primary cause of apoptosis and the consequent inflammatory response. This may resemble what is observed in humans, where steatosis can be a chronic benign condition where it only progresses into NASH in a certain percentage of the population. Moreover, our data suggests that the altered lipid metabolism found in NEMOΔhepa livers could be secondary to dysregulated gene expression in these animals. In our present work we also found profound differences in the therapeutic potential of NorUDCA and its parent compound, UDCA, in a mouse model of NASH. UDCA treatment had no major effect in improving liver injury in NEMOΔhepa mice as the compound lacked anti-inflammatory and anti-apoptotic effects in this model. Additionally, UDCA was unable to inhibit fibrosis progression and had no significant impact on proliferation and the ductular reaction observed in NEMOΔhepa livers. In contrast, NorUDCA significantly attenuated liver injury and impaired inhibited disease progression in NEMOΔhepa liver. Our molecular analysis suggests that NorUDCA may improve liver damage through different mechanisms: (1) normalisation of expression of LXR/RXR-related molecules like SREBP and FasN, leading to downregulation of fatty acids synthesis; (2) positive effect on cholesterol metabolism through upregulation of the cholesterol efflux from the liver to blood by HMGCR and by improving bile acid metabolism through the utilisation of cholesterol into BA synthesis by Cyp7A1; (3) detoxification of bile by Cyp450 related enzymes and promoting its transport and flow by normalising the expression of key transporters; and (4) the dramatic repression of SHP. In the present work we showed that normalisation of lipid and BA metabolism occurs independently of lipid β-oxidation related mechanisms promoted by PPARα but likely rely on the downregulation of lipid synthesis by SREBP, FasN and PPARγ as well as on the regulation of the cholesterol influx into the liver by HMGCR. Despite the well-know beneficial role of PPARα during NASH, as a promoter of lipid β-oxidation, we found no upregulation of this transcription factor after NorUDCA treatment. Interestingly, this could potentially contribute to the beneficial effects of NorUDCA on NEMOΔhepa mice. Production of PPARα-mediated oxidative stress after lipid β-oxidation would likely have detrimental effects on NEMOΔhepa mice, which we previously showed are particularly sensitivity to oxidative stress (Luedde et al5 and Malato et al, unpublished data). LDL via LDLR regulates liver uptake of blood cholesterol that directly promotes inhibition of HMG-CoA reductase (HMGCR). The significant increase in HMGCR levels observed in NorUDCA-treated NEMOΔhepa mice might also contribute to the reduction of available cholesterol in the liver and the increased blood cholesterol levels observed in NorUDCA-treated NEMOΔhepa mice (data not shown). Additionally, increased Abcg8 expression may contribute to the elimination of cholesterol into bile. The observed increased Cyp7A1 levels likely represent a compensatory response to the strong NorUDCA-dependent SHP downregulation, which contributes to normalising BA levels and its flow in NEMOΔhepa livers. Downregulation of SHP likely represents another mechanism of NorUDCA-mediated therapeutic effects on NEMOΔhepa mice. Huang et al26 demonstrated that SHP expression was induced in genetic (leptin deficient ob/ob (OB −/−) mice) and dietary (high-sucrose/high fat diet) mouse models of NAFLD. Conversely, genetic loss of SHP has been shown to protect from steatosis in ob/ob mice.26 In addition to increased TG export, OB−/−/SHP−/− mice show reduced expression of pathways/genes (and their regulatory factors) for FA uptake (eg, CD36/PPARγ) and de novo FA synthesis (eg, FAS/SREBP-1c) in comparison to OB−/− mice, which could contribute to protection against steatosis. NEMOΔhepa mice treated with NorUDCA would resemble the scenario found in OB−/−/SHP−/− animals, as strong downregulation of SHP along with decreased expression of PPARγ, SREBP and FasN would contribute to the reduction in liver steatosis in these animals. Upregulation of the canalicular export pump Mrp2 increases the transport of xenobiotics, anionic conjugates and other toxic agents from hepatocytes into the bile.27–29 However, Mrp2 upregulation in UDCA-treated NEMOΔhepa mice was not associated with an attenuation of parenchymal damage observed in these animals. These results suggest that additional mechanisms are needed to reverse liver injury in NEMOΔhepa mice. Interestingly, upon NorUDCA treatment in NEMOΔhepa mice we observed a strong increase in detoxifying enzymes for example Cyp2b10. A similar observation has been made in Mdr2−/− animals where NorUDCA treatment shifted toxic hydrophobic bile acids into less toxic hydrophilic metabolites, which as a consequence made up 85% of all bile acids.14 Therefore our data using NorUDCA in the NEMOΔhepa model suggest that attenuation of liver injury is achieved by improving the transport as well as the detoxification of bile acids and thus reducing BA/DR5-mediated hepatocyte apoptosis, inflammation and disease progression. Additionally, our results underscore the main relevance of bile acids/DR5 mediated apoptosis and inflammation over fat accumulation as mediators of the progression of NASH. Overall our present study indicates that NorUDCA reverses liver disease progression in NEMOΔhepa mice due to the downregulation of lipid synthesis accompanied by the restoration of bile acid homeostasis. Additionally, enhanced BA detoxification, flow and transport might contribute to the downregulation of DR5-mediated apoptosis leading to attenuation of liver inflammation, compensatory proliferation, ductular reaction and finally to the amelioration of liver fibrosis.
. Hepatocyte-specific IKK gamma/NEMO expression determines the degree of liver injury. Gastroenterology 2007;132:2504–17.
. Hepatocyte-specific NEMO deletion promotes NK/NKT cell- and TRAIL-dependent liver damage. J Exp Med 2009;206:1727–37.
. Hepatocyte-specific inhibitor-of-kappaB-kinase deletion triggers the innate immune response and promotes earlier cell proliferation during liver regeneration. Hepatology 2008;47:2036–50.
. Deletion of NEMO/IKKgamma in liver parenchymal cells causes steatohepatitis and hepatocellular carcinoma. Cancer Cell 2007;11:119–32.
. New molecular insights into the mechanisms of cholestasis. J Hepatol 2009;51:565–80.
. Targeting bile-acid signalling for metabolic diseases. Nat Rev Drug Discov 2008;7:678–93.
. The LXRs: a new class of oxysterol receptors. Curr Opin Genet Dev 1998;8:571–5.
. Bile acid regulation of hepatic physiology: IV. Bile acids and death receptors. Am J Physiol Gastrointest Liver Physiol 2003;284:G734–8.
. 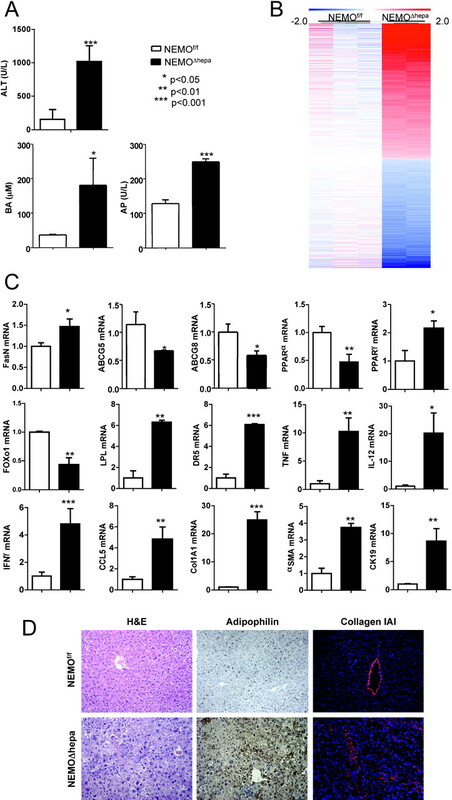 The bile acid glycochenodeoxycholate induces trail-receptor 2/DR5 expression and apoptosis. J Biol Chem 2001;276:38610–18.
. Cholestasis increases tumor necrosis factor-related apoptotis-inducing ligand (TRAIL)-R2/DR5 expression and sensitizes the liver to TRAIL-mediated cytotoxicity. J Pharmacol Exp Ther 2002;303:461–7.
. Bile acids up-regulate death receptor 5/TRAIL-receptor 2 expression via a c-Jun N-terminal kinase-dependent pathway involving Sp1. J Biol Chem 2004;279:51–60.
. Free fatty acids sensitise hepatocytes to TRAIL mediated cytotoxicity. Gut 2007;56:1124–31.
. 24-norUrsodeoxycholic acid is superior to ursodeoxycholic acid in the treatment of sclerosing cholangitis in Mdr2 (Abcb4) knockout mice. Gastroenterology 2006;130:465–81.
. Evolving gene/transcript definitions significantly alter the interpretation of GeneChip data. Nucleic Acids Res 2005;33:e175.
. SIRT1 regulates adiponectin gene expression through Foxo1-C/enhancer-binding protein alpha transcriptional complex. J Biol Chem 2006;281:39915–24.
. A combination of HNF-4 and Foxo1 is required for reciprocal transcriptional regulation of glucokinase and glucose-6-phosphatase genes in response to fasting and feeding. J Biol Chem 2008;283:32432–41.
. Ursodeoxycholic acid therapy of chronic cholestatic conditions in adults and children. Pharmacol Ther 1995;66:1–15.
. Adipophilin is a specific marker of lipid accumulation in diverse cell types and diseases. Cell Tissue Res 1998;294:309–21.
. Principles of hepatic organic anion transporter regulation during cholestasis, inflammation and liver regeneration. Biochim Biophys Acta 2007;1773:283–308.
. Endocrine functions of bile acids. EMBO J 2006;25:1419–25.
. Ursodeoxycholic acid in cholestasis: potential mechanisms of action and therapeutic applications. Hepatology 1998;28:1449–53.
. Chemical chaperones reduce ER stress and restore glucose homeostasis in a mouse model of type 2 diabetes. Science 2006;313:1137–40.
. Molecular characterization of the role of orphan receptor small heterodimer partner in development of fatty liver. Hepatology 2007;46:147–57.
. Hepatic canalicular membrane 5: expression and localization of the conjugate export pump encoded by the MRP2 (cMRP/cMOAT) gene in liver. FASEB J 1997;11:509–16.
. Bile salt transporters: molecular characterization, function, and regulation. Physiol Rev 2003;83:633–71.
. Conjugate export pumps of the multidrug resistance protein (MRP) family: localization, substrate specificity, and MRP2-mediated drug resistance. Biochim Biophys Acta 1999;1461:377–94. Funding This work was supported by the SFB TRR57 grant and by the “Kompetenznetz Adipositas (Competence Network of Obesity)”, group “Obesity and GI tract” funded by the Federal Ministry of Education and Research (FKZ: 01GI0843). NB is funded by Program Ramón y Cajal (Ministry of Science and Innovation, Spain) and by Instituto de Salud Carlos III (FIS, PS09/02010; Ministry of Health, Spain). Competing interests The Medical University of Vienna has filed a patent on the medical use of NorUDCA and Michael Trauner is listed as co-inventor. The other authors have no competing interests to declare. Ethics approval The animals were treated according to the guidelines by the National Academy of Sciences (NIH publication 86-23, revised 1985). Animal husbandry and procedures were approved by the authority for environment conservation and consumer protection of the state North Rhine–Westphalia (LANUV) and guidelines of the University Hospital Aachen Animal Care Facility.